Sadly, only a part of that formula was realised - visually Thunderbird 6 is a real treat; the model work looks stunning, especially given its age, but the film fails in every other department. The plot is sadly not up to much - crooks plan to steal a massive anti-gravity flying machine while members of International Rescue are aboard and... ummm... that's it. If Thunderbirds Are Go needed a little padding to get it to movie length - thanks to Cliff and the Shadows playing in a dream sequence - then Thunderbird 6 needed twice the amount of sub-plot support. The fact that none is forthcoming shows up the film's principal failing... at heart it's a 50 minute TV episode stretched beyond breaking point. There's little pace - aside from slow - the characterisations are surprisingly thin given the show's history, the script is woefully flat and there's little of the charm that made the series so... well, charming. In fact, it feels like the production team really didn't care, such is the lackadaisical way the whole things lumbers along - not unlike the titular Thunderbird 6, a yellow biplane that saves the day in a massively lacklustre fashion. Once again the extras on the disc appeared on last year's Twilight Time release, aside from this 'Countdown to Thunderbirds', which also features on the Fabulous Films release of Thunderbird Are Go! There really is no excuse for that. 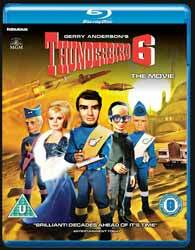 I love Thunderbirds but I don't love this film. It's a poor end to a great franchise and is probably best avoided for all but the most ardent collector.